Yesterday Politico broke the news that Mitt Romney's planned $12 million expansion for his oceanfront property in San Diego, California included "car elevators" for his four-car garage. The news is being used to again portray the Republican Presidential front-runner as being "out of touch" and "unable to connect" with the working man. That's ridiculous. The truth is the working man probably thinks car elevators are awesome. Because they are. This all started when plans for the expansion were obtained by Politico yesterday from a rival campaign showing a split-level, four-car garage with a "car lift," an outdoor shower, and a 3,600-square-foot basement. But while the Romney campaign said that it was simply a mechanism for storing cars in tight spaces, the term "car lift" quickly turned became "car elevator" for the story's headline and rivals and other media outlets were off to the races. But it's unfair to say that Romney's "out of touch" with average folks for wanting a car lift. Frankly, I think most average folks would want a car lift if they had the money to pay for them. That's because they're cool and they give you more room to store cars. 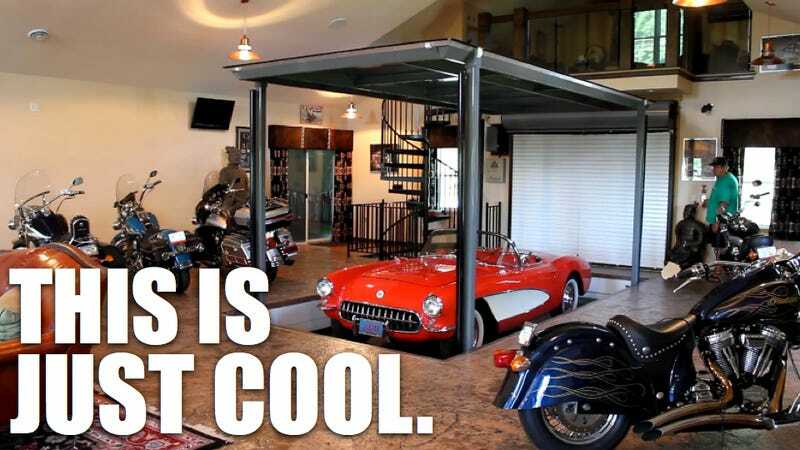 I mean, come on — who wouldn't want more space in their garage? The truth is that car lifts — like those built by the fine folks at American Custom Lifts in nearby Escondido, CA, and shown in the video to the left — are not only cool, but sometimes even necessary. Often, communities have building codes requiring no expansion of a home's footprint when renovating. Sometimes people who just need more space. And for these people, a car lift works. Let's not use Romney's car collection as an opportunity to smear Mitt Romney for wanting something that almost any auto enthusiast — hell, likely every average Joe — would absolutely want, and then having the money to spend doing it. If you disagree with Mitt Romney's policies, that's fine. I know I disagree with a lot of them. But let's stop using success and the realization of the American dream as an attack point. John F. Kennedy didn't need to apologize for coming from a wealthy family and for his personal successes — so why should Romney be forced to? Wanting a car lift doesn't mean you don't understand the working man — so stop saying it's indicative that it is. There's other evidence you can use for that.